The adapter kit is the heart of the BrewEasy™ system and includes the special lid that allows the kettles to be stacked and the wort drain tube installed. It includes the adapter lid, an AutoSparge™ level and flow control system, a drain tube with flow orifice kit, and all the needed fittings, silicone hose, and QuickConnector™ fittings you will need to operate the BrewEasy™ all-grain system. The BrewEasy™ is a revolutionary new ultra-compact and economical all-grain brewing system. This patent pending system and process utilizes a two kettle recirculation infusion mash system called the Kettle-RIMS™ or K-RIMS™ process for short. This system is very simple to use and is a very approachable way to transition from extract to all-grain brewing. 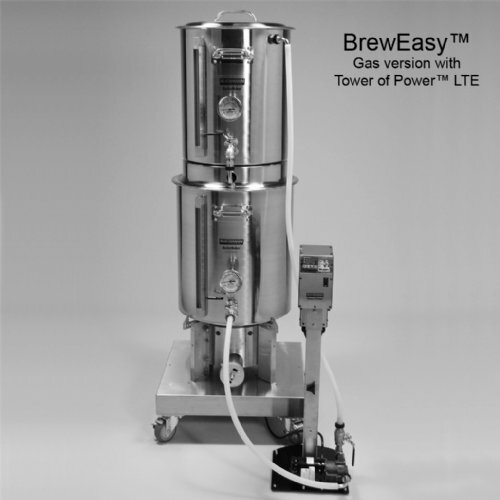 The BrewEasy™ system eliminates the need for a sparging, simplifying the process and saving time. The BrewEasy™ provides all the simplicity of a traditional no-rinse brew-in-a-bag (BIAB) system, but offers the ramping capability of a traditional RIMS system, eliminates the messy and unsafe lifting of hot grains, and provides better wort clarity than BIAB. Be sure to read through our manual (see the manual tab) to get all the details of the BrewEasy™ to see why this system may be the ticket for you! Efficient, fast, and it lets you BrewEasy™. Already a Blichmann Engineering BoilerMaker™ owner? Awesome! The BrewEasy™ is modular in nature so you only buy what you need! Offered in a gas and electric version.